A team of surgeons from Zulekha Hospital successfully removed a large tumour from the abdomen of a UAE resident in a rare and highly sophisticated laparoscopic operation. 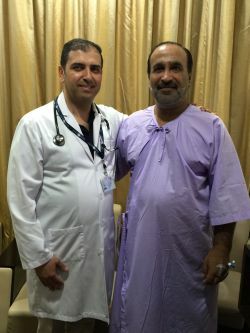 Jasim Mohammed, a 54-years-old patient diagnosed with a five centimetre tumour in August, underwent a highly-specialised, minimally invasive laparoscopic procedure which is scarcely available in the UAE. “The laparoscopic approach, which doesn’t require opening of the patient’s abdomen, is now considered the best colonic surgical procedure. Mohammed, who was suffering from lower abdominal pain, went to Zulekha Hospital after prolonged treatment at different hospitals that failed to provide him any relief. He said: “I have been in pain for a very long time. I visited several doctors and they gave me medications for many possible gastric ailments, but the pain would not subside, so I made an appointment at Zulekha Hospital and this is when the doctors discovered a huge tumour in my abdomen. Lasting three-and-a-half-hours and conducted by a team of two surgeons and nurses, the surgery involved doctors making precise incisions in Mohammed’s abdomen to insert minuscule tools and remove the affected tissue. Only 10 days after the procedure Mohammed returned to work. The procedure, utilising a video camera while handling of various surgical instruments, requires surgeons to develop special hand-eye coordination skills which, combined with the limited working area, add to the technical complexity of this surgical approach. Taher Shams, Managing Director of Zulekha Hospitals said he was proud of the accomplishment achieved by his team of surgeons. “The laparoscopic approach demands a very precise and skilled surgical technique with fully equipped team and we are glad to be able to provide this hi-tech treatment to our community,” he said. The doctors expect an increase in demand for this type of treatment in the UAE as colonic pathology, including polyps, inflammatory bowel disease, benign and malignant tumours, is on the rise, with colorectal cancer considered the second most common and fatal cancer, according to statistics published by the Health Authority Abu Dhabi (HAAD).